Exception to Rule 2.1: Do not add an s to (some) irregular countable nouns when referring to 2 or more in number. Exercise 12: Using the chart above, pluralize the nouns below. Pluralize the irregular nouns that end with us with i.
Pluralize the irregular nouns that end with a with ae. Pluralize the irregular nouns that end with is with es. 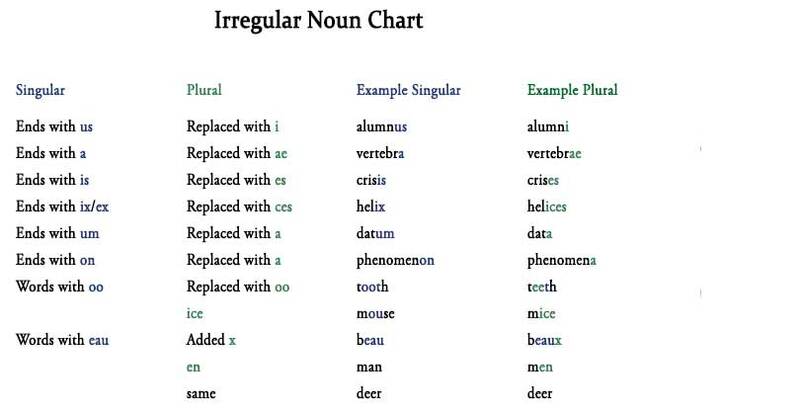 Pluralize the irregular nouns that end with ix/ex with ces. Pluralize the irregular nouns that end with um with a.
Pluralize the irregular nouns that end with on with a.
Pluralize the irregular nouns that end with 00 with ee. Pluralize the irregular nouns with ice. Pluralize the irregular nouns that end with eau with x.
Pluralize the irregular nouns with en. Exercise 14: Correct or incorrect? There are many deers in the forest. There are many deer in the forest. Most basketball players are over six feets tall. Most basketball players are over six feet tall. The old man is missing all of his tooths. The old man is missing all of his teeth. There are many fish in the sea. The professor has many thesises. The professor has many theses. Put your ideas in parenthesis. Put your ideas in parentheses. Oxes are strong, dependable animals. Oxen are strong, dependable animals. I caught a lot of trouts today. I caught a lot of trout today. John is afraid of mouses. John is afraid of mice.